By studying Hydrogen Nuclear Magnetic Resonance (1H-NMR) signals of water in porous materials, it is possible to determine their properties of water storage and transport. Besides, NMR studies can provide detailed information about the porous microstructure (porosity, pore-size distribution) of these materials. This approach is used in geophysical applications of NMR (e.g. for subsoil investigations), whereas a special NMR instrumentation ("NMR logging" tool) is lowered down into a drilled borehole. OSA NMR is a further type of instrumentation suited for applications outside laboratory environment. Comparable to an ultrasound reflection sensor, it can be applied from one side to the specimen (e.g. a building wall) and provides depth-resolved information about its internal structure (e.g. moisture depth-profile). With this instrumental architecture, NMR is applicable not only for on-site inspection but also for process integrated monitoring (e.g. in wood material fabrication). By determining the water tightness of building structures with OSA NMR, environmental durability problems can be detected in an early stage, preventing unexpected fatal damage due to moisture ingress. A further application is to monitor the drying process in fresh concrete. Moreover, NMR is highly sensitive to the cement hydration degree and the increase of internal surface area of cement-based materials. Hence OSA NMR could used for the non-destructive testing of the early-age strength development in fresh concrete. Since its discovery in 1946 Nuclear Magnetic Resonance (NMR) has evolved from a scientific curiosity into one of the most powerful spectroscopic techniques. Today it is routinely used as an analytical tool in chemical and bio-chemical research but also in physics, material science and even in geochemistry. It provides information about the physical state of matter, the structure of complex molecules and intra- and intermolecular interactions and their dynamical behaviour. In Magnetic Resonance Imaging (MRI) these chemical and physical information is combined with spatial resolution in the range between 10-3 and 10-5 m.
Even though the NMR phenomenon can be observed in roughly two-thirds of all stable atomic nuclei, the majority of NMR applications use the hydrogen (1H) nucleus. This is due to the high natural abundance and the large nuclear magnetic moment of this isotope. 1H-NMR is known to be a versatile method for measuring moisture in solid materials . Nowadays, the technology has reached a level of high sophistication and maturity. Moisture content determination in foodstuffs, powders and other bulk materials is a routine task for easy-to-use NMR benchtop systems, which are working highly precisely, non-destructively, non-contacting and fast. More and more, the potentialities of NMR and MRI are appreciated in industrial quality control. Hence NMR is far from being limited to application in research laboratories and it has already been used successfully to monitor industrial processes on-line and at-line . Usually NMR is connected with the idea of a large, expensive and sophisticated instrumentation, requiring a detailed expert knowledge for operation. To a large extent this is true for the equipment conventionally used in research laboratories. Nevertheless, usually this equipment allows investigating only small samples (< 1 cm3), because the conventional NMR technology requires, that the sample has to be inserted into the limited interior of the equipment. In regards to the testing of civil structures, this "old-fashioned" NMR is used for principal investigations of construction materials (e.g. determination of liquid transport and storage properties) and the quality assurance in the framework of material development (e.g. "high performance concrete", new additives) but not for non-destructive building inspection. 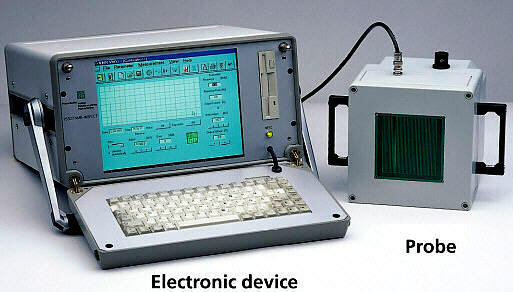 Fig 1: NMR-INSPECT: the portable NMR measuring system for on-sided access application, developed at the IZFP. A completely different instrumental approach is required, if NMR should be applied in situ, for instance to inspect the moisture situation in buildings of historical or architectural merit or to check the drying state in a freshly cast cement floor or even to characterize the geophysical properties of earth formations in boreholes. In the first two cases, a portable, robust and easy-to-use instrumentation is needed, which can be applied in one-sided access (OSA) to the test object. The in-situ determination of geophysical properties with NMR requires the so-called logging instrumentation, which can be lowered down into a borehole. At Fraunhofer-Institut fuer zerstoerungsfreie Pruefverfahren (IZFP) the worldwide first completely portable, battery-powered OSA NMR equipment was developed (see Fig. 1). At present, an instrumentation for NMR logging is constructed. These two kinds of NMR equipment provide a wide range of possibilities for practical applications of NMR in civil engineering. The possibility to image the distribution of water within a material and the ability to provide information about its physical state are two unique features of 1H-NMR justifying its increasing popularity for investigating water-related phenomenon. The amplitude A of the 1H-NMR signal is a measure for the hydrogen density and with it for the water content (see Fig. 2). NMR is a very successful moisture measuring method, because in contrast to nearly all other methods, it does not sense any changes of physical properties, which are influenced among other things by moisture but it directly detects the hydrogen content and with it the moisture content in the material . The functional dependence between NMR signal and moisture content is linear. Often, the same calibration curve can be used for different materials (see chapter 3.1). Fig 2: Schematic picture of two typical NMR signals: FID (Free Induction Decay, a)and spin echo (b); these signals can be described by the formulas below, allowing to determine T1 and T2 as described in the text. By imaging the water content distribution it is possible to analyse the actual moisture situation in detail. Due to the fact that NMR images can be acquired very rapidly, it is possible to monitor time-dependent processes as absorption / desorption and migration of moisture during capillary flow and drying (see chapter 3.2). By this way it was possible to determine the liquid transport coefficients and storage parameters in an exhaustive variety of construction materials [4, 5]. These coefficients come into general use in the basic data set for numerical computer programs allowing precise one- and two-dimensional calculation of simultaneous heat and moisture transport in building components even under complex conditions . Different physical states as solid, liquid, gaseous, adsorbed to a solid surface and chemically combined can be characterized qualitatively and quantitatively by means of specific time characteristics of the NMR signal, which are known as relaxation times T1 and T2 (see Fig. 2). In a mixture of components having different values of T1 (T2), the relaxation signal curve is composed of overlapping exponential curves representing the individual components. By separating the measuring curve into single exponentials the relative hydrogen content of each component can be determined (see chapter 3.3). As an example, this relaxation analysis is routinely used in food industry to determine the fat/water content of margarine . Pure liquid water at room temperature shows up values for T1 and T2 in the range of seconds. If a water molecule is chemically combined or in close vicinity to a surface, the relaxation times are changing drastically. For example, hydrogen of water in concrete covers a range of T2 values from 10-2 s for capillary pores over 10-4 s for gel pores up to 10-5 s for water of hydration . This relationship is used for detailed analysis of the hardening (hydration) process of early-age concrete (see chapter 3.4). In general, water within a confining geometry - as a pore - shows up a characteristic value for T1 (T2), which is proportional to the relation between the inner surface and the volume (surface-to-volume ratio, SV), which in turn is property of the pore geometry. Water-filled porous materials are often characterized by a broad distribution of T1 (T2) values, corresponding to the pore-size distribution . Hence, analysis of NMR relaxation times is a precise method for quantitative determination of pore-size distribution (see chapter 3.5). In a moist material, the hydrogen density is directly proportional to the overall water content within the detected object volume. NMR is a well established method for fast and accurate moisture determination in pharmaceutical, cosmetic and foodstuff industry . Successful aquametric applications have also been reported in technical materials as concrete, wood and polymers . Fig 3: Water content measurement in light-weight concrete with NMR; calibration to gravimetric (destructively) determined moisture content. The diagram in Fig. 3 shows a typical calibration curve, representing the functional dependence between the amplitude A of the 1H-NMR signal and the water content in light-weight concrete, expressed in mass-percent. The correlation is almost proportional. Such a calibration curve can be applied for almost all mineral construction materials (except materials with high ferromagnetic particle content). Depending on the measuring time, the inaccuracy of determined water content is typically between 0.3 and 1 mass-%. Moisture values as low as 0.5 % can still be detected. Even if the material contains other hydrogenous substances besides water, it is still possible to accurately determine the moisture content, as it is shown in chapter 3.3 . In Fig. 4 application and results of a moisture profile measurement on a lightweight concrete pillar are presented. The red line in the diagram shows the moisture profile as it was determined on-site. The profile could be determined up to the maximum measuring depth of the used OSA NMR device, which was 26 mm. The entire measurement with a resolved depth-increment of 1 mm and an inaccuracy better than 0.5 % has taken approximately 30 minutes. This result indicates a water content increasing strongly in depth. The strength of this result was not clear, because the reinforcing steel bars embedded in concrete could eventually result in false readings of the water content. In order to verify the measurement result, a drilling core 150 mm in length was drawn leaving out the steel reinforcement bars Later this drilling core was investigated in the laboratory. For the purpose of measuring the moisture distribution across the entire length of this sample, it was cut into 3 pieces of about 50 mm in length. By measuring from the upside as well as from the bottom side of each piece, it was possible to determine the moisture content at each point of the drilling core despite the limited maximum measuring depth of 26 mm. This "laboratory" moisture profile is shown as black line in the diagram of Fig. 4. Apart from small differences at the beginning, probably as a result of the one-day delay between on-site measurement and sampling, a good accordance between the "on-site" profile and the "laboratory" profile is obvious. Therefore it can be concluded that in the present case the steel reinforcement does not have a significant influence on the NMR measurement. Note, that the strongly decreased moisture contents at about 50 and 100 mm are a consequence of the cutting process. Finally, the integral moisture contents of the cut pieces have been determined by gravimetry (weighing, drying and re-weighing). The moisture contents determined by this method are shown as grey straight line in the diagram. Fig 4: Moisture profile measurement on a lightweight concrete pillar. The diagram on the left shows the on-site measuring result (red line) as well as the moisture profiles (black line) and the integral moisture values (grey straight lines) from laboratory measurements. With OSA NMR current moisture situation and variations of water distribution during wetting and drying can be observed directly on the building component. Entire building constructions can be inspected in a complete non-destructive manner, without the need for impairing its integrity or its appearance by taking a sample. By determining the water tightness of building structures, environmental durability problems can be detected in an early stage, preventing unexpected fatal damage due to moisture ingress. A further application is to monitor the drying process in fresh concrete or cement floorings [13, 14]. The profiles of moisture and density across the panel thickness are the most important measuring parameters for characterizing and controlling the product quality in fabrication of chip (and fiber) wood panels. Usually, the density profile of small samples is determined by laboratory methods. Nowadays, the raw density profile in wood panels can be measured on-line with devices based on Compton backscattering . But due to the similar scattering and absorption properties of solid wood and moisture, these methods do not accurately determine the dry wood density, which is by for more interesting than the raw density. Fig 5: Simultaneous density and moisture determination in wood panels; by analyzing the T2 relaxation curve the signal contribution from hydrogen in solid wood (left diagram) can be separated from the signal contribution of moisture (right diagram). Based on the analysis of the T2 relaxation curve, solid and liquid wood components can be quantitatively distinguished by NMR. As mentioned in chapter 2, here the relaxation curve is composed of 2 overlapping exponential curves representing hydrogen in solid wood and hydrogen in wood moisture. By analyzing the measuring curve the relative hydrogen content of both components can be determined. On this approach wood moisture as well as the dry wood density can be measured in a single procedure (see Fig. 5). By using OSA NMR, profiles of moisture and density can be determined on-line during panel fabrication. Fresh concrete develops in strength over time. Initially, after casting, the concrete is supported within a formwork until it gains sufficient strength to support its own weight. Early age damage as well as increased susceptibility to detrimental influences from the environment (reduced durability) can often be traced to insufficient strength development prior to loading of the structure. Event though a variety of methods to measure the properties of fresh concrete are already available, monitoring the strength development in early-age concrete is still an unsolved testing problem. Conventional methods, as for example the Vicat needle test, the slump test, the flow table test, etc. are not objective because the results are highly dependent on the measuring device and the measuring procedure. None of these methods allows continuous monitoring of material properties from the fresh to the hardened state, because they are destructive. During hydration a part of the mixing water is chemically combined in hydration products and the residual water is confined in pores, which gradually decrease in size as cement hydration proceeds. These processes strongly affect the T1 and T2 relaxation times. On the other side, the same changes of cement-stone's microstructure affecting the relaxation times are also responsible for the development of the physical properties, as strength and tightness. Therefore, measures of T1 (T2) allow for monitoring the strength development in hardening concrete. By use of OSA NMR instrumentation this method is a new approach in order to continuously monitor the hardening of concrete on a building component. The hardening behaviour of five different concrete mixtures as well as pure cement pastes has been investigated in the present study. The specimens were prepared by using conventional Portland cement. Different water-to-cement ratios (w/c) as well as enrichment of some specimen with a retarder (Tetra-Potassium-Pyrophosphate) should provide a wide range of hardening behaviour. The concrete hardening was monitored over three days. Starting with the preparation, the T2 relaxation curve measuring of each specimen was measured after hardening times th of approximately 1, 2, 3, 4, 5, 6, 8, 9, 23, 25, 27, 29, 31, 59 and 60 hours. Fig 6: Monitoring of concrete hardening by T2 relaxation curve measurements. As hardeing proceeds the decay of the T2 relaxation is getting faster (left diagram), which is equivalent to the decrease of the relaxation time T2 as a function of hardening time(right diagram). The left diagram of Fig. 6 shows the evolution of the T2 relaxation curve of a specimen for 4 different hardening times. It is much of evidence that the decay is accelerating as hardening, i.e. cement hydration proceeds. Fitting the experimental data to an one-exponential approximation function provides the time constant of the decay curves, which is the relaxation time T2. From the beginning up to the end of hardening, this relaxation time shows typically a strong decrease (right diagram of Fig. 6). In case of cement paste or concrete without retarder (S1, S3 and S4 in the right diagram of Fig. 6), this decrease is moderate in the first 2-3 hours after mixing water and cement. This "Induction Period" is followed by an accelerated decrease ("Acceleration Period") up to 20-30 hours and finally hydration and with it T2 decrease are slowing down ("Decay Period"). Hence the T2 evolution follows the hydration progress and with it the qualitative behaviour of strength development in concrete. The influence of a water-to-cement ratio (w/c) which is only 0.4 instead of 0.6 can be observed by comparing the hydration behaviour of specimen S1 and S3. Specimens with retarder (S2 and S5) show the most peculiar behaviour. As expected, the "Acceleration Period" is strongly delayed. The strong dependence between T2 (and also T1) and the hardening state in cementitious materials is a well-known fact . In literature it was shown, that this correlation can be used to predict the strength-development in early-age concrete . The concern of the present study was to demonstrate the feasibility of monitoring the hardening in concrete by conducting T2 measurements not only with laboratory NMR equipment but also with OSA NMR, offering the possibility to inspect early-age concrete on a building side. So-called NMR logging tools are used for on-site characterization of subsoil earth formations in regards to porosity, oil / water saturation, pore-size distribution and permeability. These tools are used for the exploration of oil or water wells and the determination of building ground stability. Architecture and mode operation of logging NMR are very similar to OSA NMR. Based on the experiences from NMR-INSPECT development, a NMR logging tool for borehole exploration is constructed at IZFP at the moment. Simultaneously to this hardware development, experimental NMR methods are studied, which are capable to determine microstructure dependent properties of rock materials, as porosity, pore-size distribution and water permeability. Fig. 7 shows the measuring results of the T1 relaxation time distribution in soils of unconsolidated material. Two specimens with different grain distributions have been investigated. The blue curves in the foreground of the diagrams show the NMR T1 distributions, which correspond to the pore-size distributions. The beams in the background show the grain distributions derived from sieve analysis. It is obvious, that there is good qualitative agreement between NMR measuring data and sieve analysis. Fig 7: Grain-size and pore-size distribution in unconsolidated material (soil); brown bars: grain-size distribution, determined by sieve analysis; blue lines: T1 relaxation time distribution (NMR measurement), corresponding to pore-size distribution; left: fine grain distribution (without gravel); right: coarse grain distribution (with gravel) . For a long time, nuclear magnetic resonance (NMR) instrumentation was found only in laboratories of institutional and industrial research facilities. Nowadays, special NMR equipment is available, which can be lowered down to a borehole in order to characterize water and oil deposits or which is one-sided (OSA) accessible to the specimen in order to inspect the moisture situation in a building wall or. NMR-INSECT - developed at the IZFP - is portable, robust and easy-to-use device which is based on this OSA NMR approach. It combines the large potential of NMR with an instrumental design, fulfilling the requirements of non-destructive testing on building-sites. The experimental results have shown, that OSA NMR is a powerful tool for determining a variety of water related properties of mineral construction materials and soils. Spatially resolved measurements of the water content provide an unique possibility to characterize drying and wetting processes in building materials and with it to recognize the risk for a reduced residual life time at very early times - a clear progress in the light of structural safety. NMR relaxation measurements could help to accurately control concrete work (production and mixing) as well as to monitor workability and strength development after setting. For the first time, it is possible to accurately determine the time for demolding or removal of formwork in-situ. Further applications arise from the identification of early stiffening and flash set in ready-mix suppliers.